Every year we put our fundraising efforts into the community. 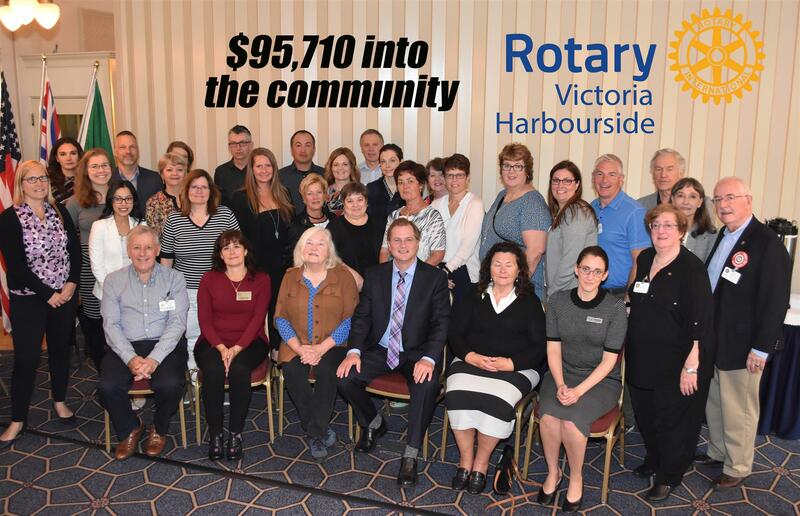 In the past two years alone, (to fall, 2018) The Rotary Club of Harbourside and its Harbourside Foundation have handed out well over $260,000 to organizations such as the below. YMCA-YWCA Strong Kids Program: Pandora Youth Apartments, for youth age 15 to 19 to support semi-independent living. Quadra Village Community Centre – provide a continuum of services and support for George Jay families over the summer. Vancouver Island Kids Klub Society – school lunches for kids who would otherwise go without. École Quadra School – Read and Write Program, transportation to events and library books. Victoria Women’s Transition House Society – PEACE camps for children who have witnessed domestic violence. Ecole George Jay School – calming spaces, books forkindergarten kids and parent education sessions. Stigma Free Society – peer support groups. Victoria High School – replace kitchen appliances. Power to Be Adventure Therapy. Fall 2018 we received a grant from the Rotary Foundation and coupled with club proceeds created a fund of over $138,000. These dollars are targeted to a project dear to the heart of our membership, training and personal empowerment to 200 women and graduating high school students in greater Tegucigalpa and Comayagua, Honduras. Guatemala: capital funding for micro credit loans and basic business training for women. Rotary Youth Exchange (youth experiencing another culture for a school year).